Lush Fab Glam Inspired Lifestyle For The Modern Woman: Spring Cleaning Tips: Maximize Your Time, Minimize The Fuss And Make A Pretty Penny. 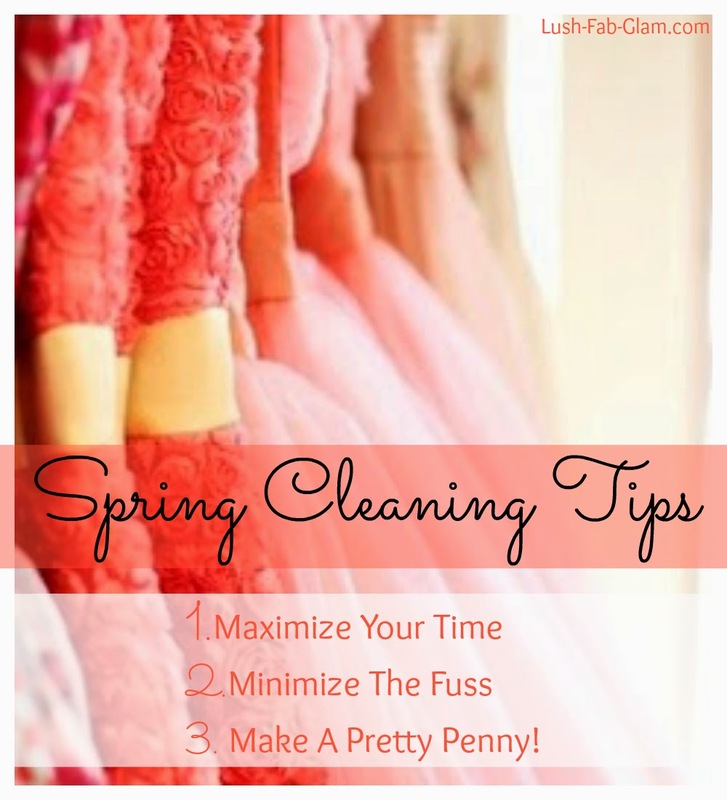 Spring Cleaning Tips: Maximize Your Time, Minimize The Fuss And Make A Pretty Penny. This post is brought to you by our affiliate Gazelle. 1. There are the obvious advantages of spring cleaning like the coins and forgotten dollar bills you find between your sofa cushions, in your desk drawers or coat pockets. You can also sell off the items that you rediscover while cleaning. There is no need to hang on to things that you no longer use or need and you don't have to watch the hard earned money that you spent purchasing them get tossed into the trash either. 2. A garage sale is a tried and true way to sell off everything from old furniture, books, clothing and toys. 3. You can also use online sites such as Ebay or Craig's List to sell items that are more valuable, like your out of season designer handbags, shoes, old music records etc. 4. There is also value in the things that you consider broken and may see as no more than something to be tossed out like your old electronic devices. Last year's e-reader, the laptop with the old processor, the iPhone with the cracked screen. Believe it or not, these gadgets creating clutter in your drawers and shelves are cash waiting to be collected! Minimize the fuss and time that will be wasted searching for someone willing to buy your old gadgets and easily find out what they are worth by simply mailing your device for a trade-in with Gazelle. Shipping is free if your broken or used electronic is worth more than $1. Plus starting May 5th, Gazelle will pay an extra $10 for any device valued at $50+ that you trade in. An iPhone 4S, for example, can fetch up to $155 on Gazelle and with this promotion would be worth $165! This year you can enjoy spring cleaning knowing that your home will be clear of the clutter, you'll be doing the planet a favor by recycling/re-purposing your old, broken and used items and as an added bonus you can make a pretty penny to save or use for your upcoming spring and summer adventures when you turn your unused electronics into extra dollars with Gazelle. How do you make extra cash from spring cleaning? Share with us by leaving a comment below. *P.S. Don't forget to share this fab spring cleaning tip using the share buttons below. These are great tips! I need to get to spring cleaning!